I like to get outdoors in all kinds of weather, In good weather I'll sit right on the ground next to a campfire, If it's cold or rainy I like some sort of seat. I like to use a stool but couldn't find one light enough so I decided to try making my own. Basically this is just a triangular piece of heavy fabric with a pocket sewn in each corner. When I get to camp, I cut three good pieces of wood about 18" - 20" long, round one end with my knife and point the other one. Lash the three together in the middle, spread out the legs, put the rounded ends in the fabric and push the sharpened ends into the ground........Taa Daa... 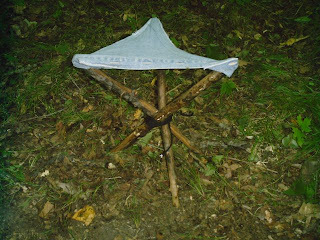 Instant camp stool. The picture above was a prototype I quickly made up to test on my last trip. It worked great and I will now be making one a little nicer and in a heavier fabric. Have a great weekend. My Amazon Author's Page ! Hello and Thank You for checking out this site. If you like what you see, please follow me. If you have any ideas, suggestions or opinions, please email me at nev@northeastvoyageur.com I do want to hear what you think and how we can improve. Receive new Northeast Voyageur posts via email ! Copyright 2011 northeastvoyageur.com. Picture Window theme. Theme images by macroworld. Powered by Blogger.